You’ve probably been hiking and brushed up against the stem of a stinging nettle and had someone in the group grab a nearby plantain leaf, bruise it with their finger nails and hand it to you to put on the sting. If you followed the ancient practice, you found relief in minutes. Plantain is a broad species known for its amazing healing properties. It is so renowned for healing that settlers brought it with them when they travelled to North America from the “Old Country.” Plantain is naturalized worldwide and there are 200 species of plantain with many beneficial uses. You’ve probably encountered plantain as the OTC constipation-relieving drug, “Metamucil” a remedy based on the mucilage seeds of P. syllium. The plantain that you are probably most familiar with is Broad Leaf Plantain or Major Plantain. Broad Leaf Plantain (Plantago major) grows in disturbed areas such as lawns, gardens, roadsides, ditches, and on the sides of creeks and streams. It was brought to North America by the puritan settlers and was called “Whiteman’s footprint” by the First Nations due to its prevalence near settlements. Plantain is edible when young as a salad green, but the leaves become fibrous as the plants grow older. The seeds, while tedious to gather, can be ground as a flour substitute. They are bitter and should be rinsed and dried, in much the same way as quinoa, before cooking. The leaves contain calcium and vitamin A, among other minerals and vitamins. Plantain’s main value is as a medicinal herb. It is used worldwide for herbal medicine and is one of the most accessible and abundant herbs. The fibrous sinews in the leaves and stems are flexible and strong. These can be separated from the leaves and used to make cordage, fishing line, or sutures in a survival situation. There are ornamental varieties for home gardeners. The ornamental varieties will have many of the same benefits as the native species. As you can see, Plantain is an important plant to know both for herbal remedies and for survival needs. You can find it world wide and use it as needed. Plantain is one of the first herbs to regrow after the snow melts. And it stays green until killing frost, so you should have no trouble finding a plant when you need it, 3 seasons of the year. For illness use the leaves fresh or dried as a tissane/tea. It can treat gout, heal sore throats, help with coughs and chest congestion. It also heals ulcers and is a good treatment for diarrhea as it replenishes many of the minerals that are lost through the illness, while stopping the flow. The muciliage also acts as a laxative, so is more beneficial in the treatment of diarrhea than OTC preparations that can cause constipation. For wounds or skin infections apply plantain ointment. It increases skin rejuvenation, is antibacterial and anti-inflammatory. Plantain is just what you need to heal minor scrapes, bites, and cuts. You can add calendula oil and St. Johns Wort oil, along with lavender and tea tree e.o. to increase the healing effect. 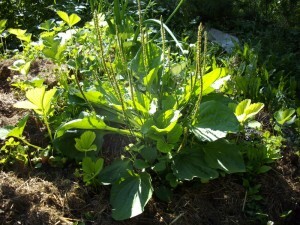 To make an ointment begin by gathering fresh plantain leaves in July or August. Wash the leaves, dry thoroughly, and cut into fine pieces. Put into a mason jar and fill the jar with olive oil. Cap the jar. Allow to sit in a warm dry place for two to three weeks. Shake the jar once a day. The oil in the jar will turn dark green. Strain out the leaves. Use the oil in the jar to make a healing ointment. If you can’t wait for the plantain to be ready to harvest in your area, you can get plantain and other organic herbs from Mountain Rose Herbs. Mountain Rose is my source for quality organic herbs, spices, and teas. While still warm, pour into glass jars. Cap while warm. Label the jars and date your batch. Store jars in a cool, dry place. Jars should be solid at room temperature. Makes 5 – 3.5 oz. (100 gram) jars of ointment. If you are hiking or gardening and meet up with a bee or a nettle you can grab a plantain leaf and make a poultice to bring immediate relief of pain and inflammation. Plantain has a reputation for drawing poison out of a wound. The sooner you act the faster the relief. Watch this video that shows you how to make a plantain poultice to treat nettle stings. Its part one of a series of harvesting stinging nettle for spinning and weaving on the Joybilee Farm TV channel. Now that you know how to treat a nettle sting to get immediate relief, you’re ready to learn how to harvest nettles for spinning. 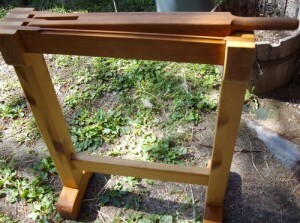 Tomorrow I’ll show you how to harvest nettles for fiber. Its different than harvesting nettles for food or medicine and you need to time it just right. When to harvest nettles depends on where you live. For me that is August. But I’m telling you about it early so that you can be ready when the time is right in your region. which is better to infuse dried leaves or fresh? If you are infusing oil, use fresh leaves but let them wilt slightly before putting them in the oil. If you are making a decoction with water, either works, but dried leaves are easier to store. That is a amazing article. I appreciated the details good deal. I’m going to bookmark these pages. Many thanks spreading this data. I believe narrow leaf plantain has the same medicinal qualities…Do you now if that’s true? Definitely does. They can be used interchangeably. 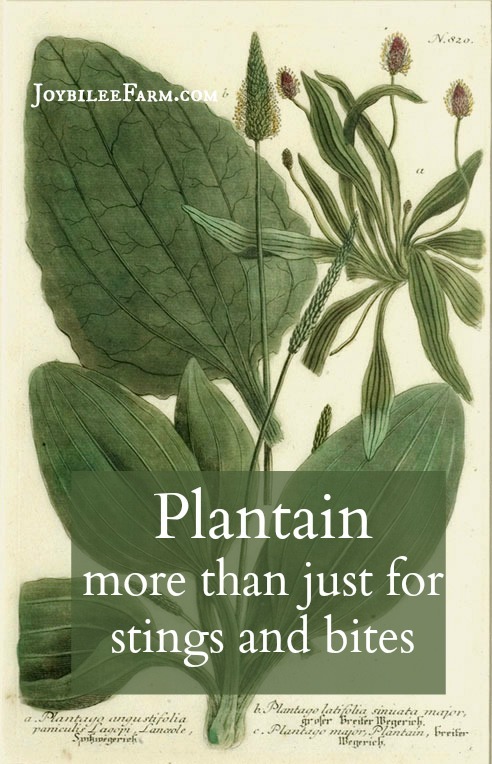 I learned in my research that there are over 200 plantain species world wide. Most have similiar properties.